In a 6-quart soup pot or Dutch oven, cook bacon over medium heat until crisp. Remove bacon from oil and transfer to paper towels; when cool, chop and reserve. Brown chicken (or chicken parts) in bacon drippings. 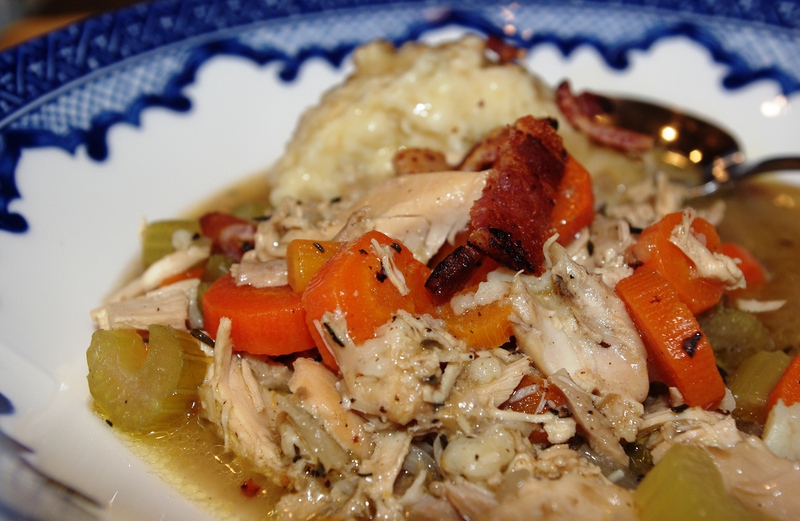 Remove chicken from Dutch oven and reserve; discard all but 1 tablespoon fat. In the same pot, add olive oil and onions; sauté onions until lightly browned. Add carrots, celery, garlic, and shallot; sauté until fragrant and soft, about 5 minutes. Stir in flour and cook, stirring, until flour is slightly browned, forming a roux. Serve the stew garnished with the reserved chopped bacon.